Dining Out is truly ENJOYable! Thanks to the folks over at Spot.ph, I squealed in delight upon seeing this lovely red tin can that I know holds the key to almost a hundred discounts and freebies in various restaurants not only here in Metro Manila but in Cebu and Boracay as well. This is Enjoy Philippines this has been highly recommended by fellow blogger Anton who will even offer a 5% discount in any Ultimate Philippines tour of your choice. It has been barely a month since I got this gift and I've already made use of both the card and the coupon booklet a number of times. First was when I met up with my dear friend Sab for lunch and coffee at UCC, followed by a quick lunch at Pho Hoa, then there was that dinner at Super Bowl of China and countless others that I've happily visited and availed of their discount and freebies! One tin can contains the membership card, two coupon booklets (one for Metro Manila, another for the provincial outlets) and the registration card. Sadly, this is only valid until June 30, 2010. I sure hope they will extend and will give existing card holders a good deal whenever we would choose to renew. I also like visiting their website regularly as they continue to add in more partner merchants. Now they have a deal with Dusit Thani's food establishments such as Basix, Tosca, Benjarong and my favorite Umu. You can also purchase appliances at Western, Listening in Style and from Ariston which is actually perfect as Paul and I are about to start a major renovation project for our future room. 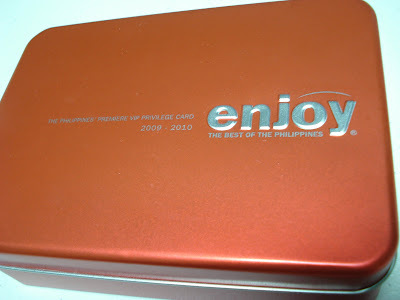 I really do ENJOY dining out nowadays with the help of my Enjoy Philippines card! It's big savings and big happiness all rolled into in one! 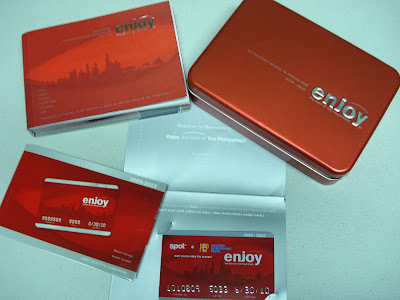 Wow, where can one get an Enjoy card?